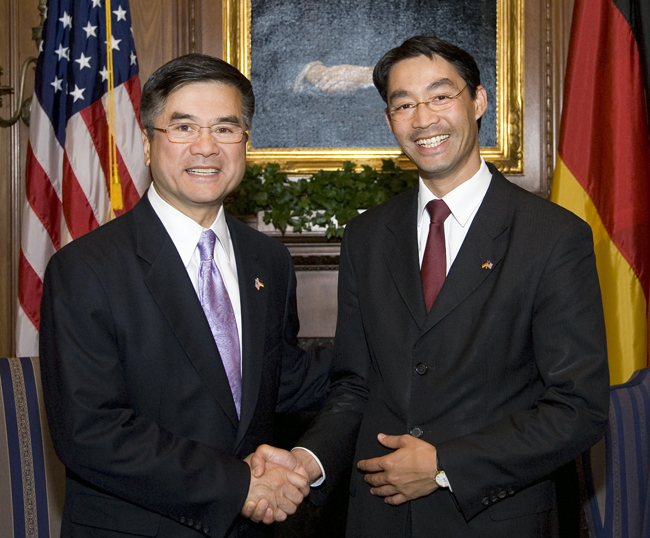 Commerce Secretary Gary Locke met with the recently-appointed Vice Chancellor and Federal Minister of Economics and Technology Dr. Philipp Rösler today and discussed ways to strengthen U.S.-Germany commercial relations. Locke and Rösler had a productive conversation on a variety of topics, including U.S. commitment to the Transatlantic Economic Council and the upcoming re-launch of the U.S.-German Informal Commerce Exchange this fall, where issues related to regulatory and standards cooperation, renewable energy, e-mobility and market access will be discussed. Locke also expressed the Commerce Department’s desire to work closely with the new leadership of the Ministry of Economics and Technology under Rösler. He is a member of German Chancellor Angela Merkel’s official delegation to the United States.